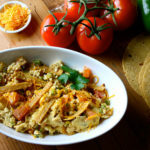 Our version of the traditional Tex-Mex breakfast scramble with crunchy tortilla strips, onions, tomatoes, and peppers has only 229 calories per serving, and the servings are hearty. Try our lighter version of a traditional Tex-Mex breakfast scramble with crunchy tortilla strips, onions, tomatoes, and peppers. Combine eggs and egg whites in a medium bowl; whisk to blend. Set aside. Add tortillas; cook, stirring occasionally, for 3 to 4 minutes, or until crisp. Remove tortillas from pan. Add tomato; cook for 3 to 4 minutes. Add egg mixture; cook, stirring frequently, for 3 to 4 minutes, or until eggs are almost set. Add tortillas and cheese; cook, for 1 to 2 minutes or until cheese is melted. Enjoy as part of breakfast with bonus veggies.